So you're ready to adopt a dog? Choosing a dog can be one of the most exciting moments in a person's life. With the proper care and surroundings, a dog will become your best friend and will provide you with years of unconditional love. So choosing the right dog is a very important decision. But keep in mind that owning a dog is like having a 2 year old child that will depend on you for food, shelter, and hygiene for as much as the next 10 to 20 years. When choosing a dog, keep in mind that you are adopting a new family member. New dog owners need to be prepared for their new family member with research and knowledge on what to expect. Once you have established your relationship, you will be amazed by the unconditional love your dog will give you for years to come. What size dog should I get? Who will be the dog’s primary care giver? How much activity will the dog be around? Do I want a puppy or a grown dog? There is no such thing as a "free" dog! 1. What size dog should I get? Big dog, little dog, or somewhere in between. Keep in mind your living space. 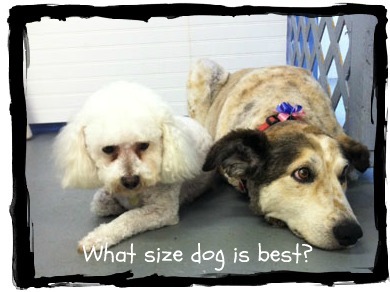 There are pros and cons to every size and breed, so do your best to educate yourself when choosing a dog. There are many advantages to owning a dog. One advantage is dogs make a great deterrent to home invasions. A small dog is the best “burglar alarm” due to their nervousness. They will sound off at any strange noise, waking their owners and scaring away burglars. A large dog can deter a possible invader just by their size and look, and are more effective in protecting their owners from physical threats. A small dog will attack anyone threatening their owners, but lack the intimidation of a large dog. Large breed dogs need lots of space to run and play. They tend to get restless and can develop physical problems such as hip displasia when confined to a small living space. Small dogs tend to burrow under blankets and cushions, so be careful before plopping down on the couch or jumping in the bed. 2. Who will be the dog’s primary care giver? When choosing a dog, you need to determine who the primary care giver will be. Will it be you, your spouse, or one of your children? If one of the children is the primary caregiver, be sure there is an adult to follow up. Children can learn responsibilities from caring for a pet, but are not mature enough to take on all the responsibilities of parenting a pet. Be sure to show the children the proper use of dog products and dog supplies such as brushing the dog's hair, and how much food to feed the dog each day. 3. How much activity will the dog be around? Choose according to the household personalities. If the humans in the household enjoy energetic activities such as running, outdoor sports, and other high energy activites, choosing a dog with high energy would be a good choice. However, if the humans in the household are more quiet, reserved, and likes everything kept neat, a choosing a dog that is a low keyed breed would be a better choice. If your household is a mix of the two types, you'll want to start with who the primary caregiver will be and build on that. 4. Do I want a puppy or a grown dog? Do you have time to puppy train a dog? You will have to puppy proof your house that same as baby proofing for a child. I don't think you'll have to worry about the pup sticking a fork in the outlets, however, be sure all the wires to the electronics are up off the floor since puppies love to chew. Have a table or stool to place your shoes on when you take them off. A pup will explore and chew his way through his new environment the same way a child tends to put everything in his mouth. You'll have to potty train a puppy just the same as you have to potty train your children, so be ready to teach with kindness the same way you would teach and potty train your children. Choosing an adult dog will allow you to by-pass the "puppy stages". He will be past the chewing stages and easily, if not already, house trained. You can instead concentrate on developing a relationship with your new family member. A grown dog will have already developed most of his personality by the time he reaches adulthood. If you are unaware of his origins, he may be have fears that are unexplainable since you have no idea what he is thinking and what he has been through in life so far. Whether you choose a puppy or an adult dog, the rewards of the unconditional love will out weigh any and all the training. Pet owners tend to be less stressed and happier overall. 5. What dog breed should I choose? The sky is wide open on this subject. You don't need to concentrate on a specific dog breed such as a Poodle, Chihuahua, etc., but more on the general breed such as a Terrier, Toy, Working, etc. Once you've determined the size and temperament, you'll want to consider the hygiene responsibilities. Keep in mind long hair, short hair, whether the dog sheds, and how much grooming is required. All dogs need to be brushed every day, just the same as people need to comb or brush their hair every day. Long haired dogs might need more brushing to prevent tangling. 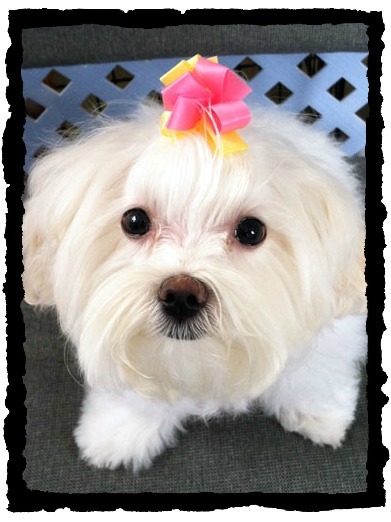 Determine if your dog will need regular trips to the groomer to keep their coats manageable. Schnauzer, Shih Tzu, Poodles are the most common breeds that need regular grooming on average every 6 weeks. 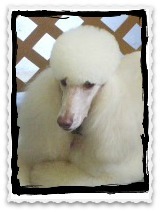 Check the grooming rates in your area and include those costs in determining if this is the dog you want. How much will my dog cost? While choosing a dog, don’t rule out the mutt. They tend to be less prone to illnesses since they are not breed within there own bloodline, and are typically very smart and easy to train. 6. There is no such thing as a "free" dog!!! My "free" dog cost me $200 in vaccinations, worming and license. Then there was the cost of dog supplies such as a dog bed, dog food, and dog hygiene products, all before I got him home. Extra costs could include fencing in the yard, leashes, collars, etc. 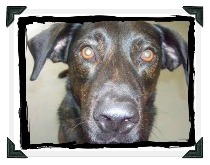 At 6 months you'll want to have your dog spade or neutered for his/her benefit and yours. Check with your local Humane Society for discounts and assistance. They can refer you to the options available. I highly recommend starting at the Humane Society or Animal Shelter when choosing a dog. The adoption fee usually includes most of your beginning costs, such as vaccinations, spade or neutering, and identification chips.